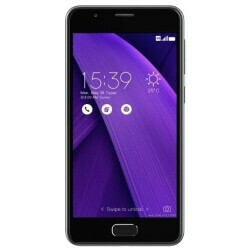 A new Asus ZenFone 4-series press image appeared online, alongside a purported spec sheet and price tag. Mind you, we wouldn't say that we are 100% confident in what we are seeing here. In particular, the dual camera module on the back of the handset looks poorly edited. However, the rest of the images hold up and appear convincing, even though the smartphone's design isn't at all exciting or innovative. For all the unconventional phones we saw this year, such as the Galaxy S8, the LG G6, and the Essential Phone, manufacturers from China and Taiwan seem to be compelled to retaliate with a barrage of iPhone lookalikes. Perhaps looks aren't that important for some people and besides, the Pegasus doesn't look bad – just boring. Then again, the leaked spec sheet suggests this is a mid-range model, which means certain corners had to be cut to bring a specific ratio of design and performance features to a determined price point. So a non-boring design was no-go, and the Pegasus 4A supposedly ended up with a 5-inch 720p-resolution display (kind of low, considering 1080p screens are often seen on budget-ish devices) a MediaTek MT6737V chipset (cost-effective quad-core model) with 3GB RAM and 32GB storage, a pair of 13MP/8MP rear cameras and a 5MP front camera, a 4100mAh battery, and Android 7.0 Nougat. Not awful or anything, but with a price tag of 1800 CNY (around $263), the handset isn't a superb deal by either Chinese or international standards. We suspect the presence of a duo-camera with the work that went into its software and integration have driven the price up. While the ZenFone Pegasus 4A probably won't reach the United States, considering its MediaTek chipset prevents it from shaking hands with US LTE bands, it could very well end up being sold in Europe and Asia. Asus could announce the smartphone, admittedly an affordable choice for a duo-camera device, by the end of July.